Learn how to set up your custom touchpoint types so you can start tracking them in Planhat. Create anything, like a meeting or a training. How to start adding and using the Touchpoint Types in Planhat! When you are reaching out and interacting with customers, it is important to differentiate which type of interaction you had with them. A support chat doesn't have the same weight as an email, and an email doesn't have the same weight or meaning as an in-person training/meeting. Therefore, as a CSM you need to know what the interaction was in order for you to take the best action. 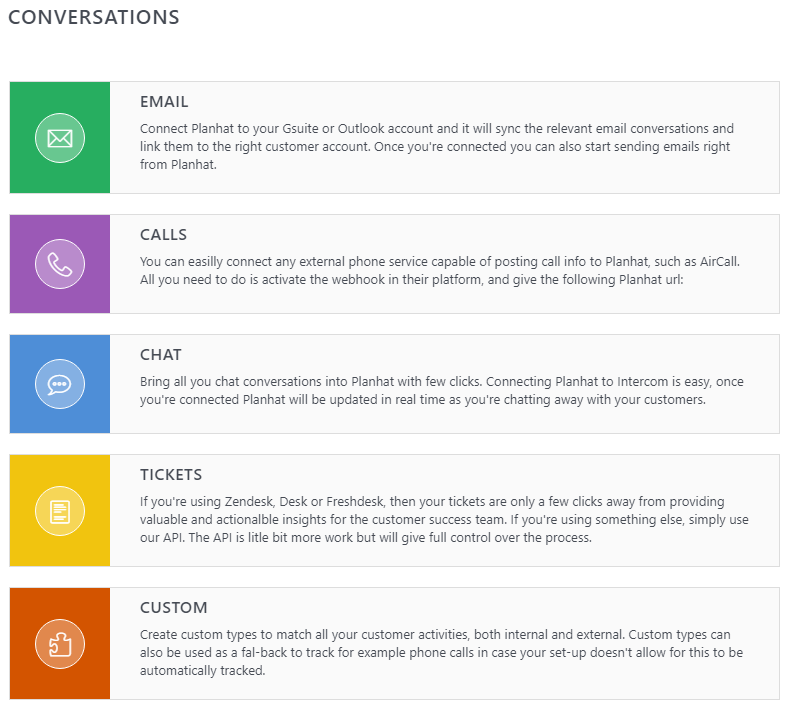 To set up your TouchPoints in Planhat you will need to hover over your avatar in the bottom-left hand corner, click on Conversations and then click on Custom. Note this is only available to team members with the Admin role in Planhat. Let's look into each Type. But, before we do I want to quickly explain the differences between what Planhat calls an "Internal" touch point and an "External" touchpoint. Internal = all of the touch points that don't involve you communicating with a customer, but could be tasks that you want to record in Planhat that need to be conducted internally. For example, meet with team member about how to move forward with company "x" before QBR. The company is still being worked on and receiving attention, but the customer is not being involved. External = all of the communications that involve a customer. So when you email them, call them, meet with them, etc. These will be recorded and logged separately in Planhat for better reporting on processes. This is where you can sync your Gmail account with Planhat, and also where you create your email templates. Once you sync your email with Planhat we will pull in these conversations (from the inboxes you have specified), and automatically record them as an "email" external touch point. If you are using an external phone system, and this is a large part of your business or Customer Success strategy - then you can connect it with Planhat through the calls API endpoint. OR if you're using Aircall, you can simply set it up with our native integration! Then, Planhat will log these in your activities as an external touch point. Get set up with our native integration with Intercom - it only takes a couple of minutes to get set up! If you aren't using Intercom, or have an internal chat tool - ask us for the API endpoint and we can see if this is a good option for getting your chat tool synced into Planhat! Planhat records these as external touch points. Tickets are important to know about as a CSM, but you are usually not the one who is responding to the request. But if you have a call or a meeting with a customer, you probably want to know if there are any outstanding tickets! We have native integrations with Zendesk, Freshdesk, and Desk (Salesforce) and they only take a few minutes to set them up. But, again, if you aren't using any of these you can use the ticketing API endpoint. Tickets are external touch points. Learn more about what you can do with tickets here. This is where you can set up some of your own! If you would like to record things such as a "Training," "Demo," "Technical Walk-Through," etc you can do that in this section. Any time you want to edit or delete a custom touch point, simply click on it and it will open it up for you to edit. As you are logging and recording these, you will see all of these interactions reflected in the Insights section of the Activities module.